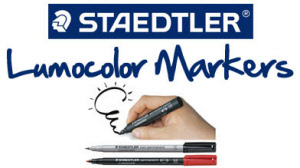 Design awarded, world-leading STAEDTLER Lumocolor® Universal Marker pens for use on overhead film and almost all surfaces. Available in boxes of individual colours or assorted wallets in either water-soluble (non-permanent) or permanent. The range of 8 colours and 4 line widths ensures you have the right solution for all your writing needs and can be used in almost every imaginable field of application.